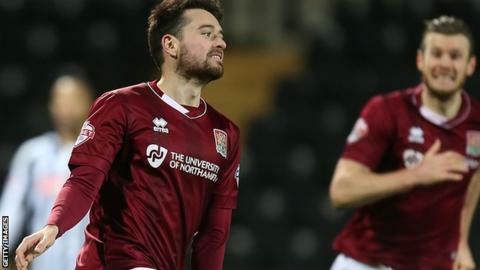 Goals from Rod McDonald and Brendan Moloney helped financially-troubled Northampton earn a narrow victory at Notts County in League Two. The Cobblers have not been able to pay staff for three weeks and face an administration petition on Friday. McDonald headed in Nicky Adams' cross for the opener, but Jon Stead slotted in to level the scores after the break. Moloney then fired home from the edge of the box to seal the three points and keep Northampton third in the table. Chris Wilder's team are unbeaten in six games in all competitions, but the result was overshadowed by Thursday's news that a proposed takeover by former Oxford chairman Kelvin Thomas is in doubt. Former Cobblers chairman Barry Stonhill has since said that he is part of another group in talks to buy the club, who owe £10.25m in loan repayment to Northampton Borough Council, and a further £166,000 in unpaid taxes to HM Revenue & Customs. "There's a deal to be done at this club that can make this club challenge in League One. "I know the deal. It's got to be done. I've had an enquiry about (striker) Marc Richards from another club - he didn't want to go. "There have been enquiries about me, too. But I know what we can do at this club. This is not a rescue deal, it's more." Match ends, Notts County 1, Northampton Town 2. Second Half ends, Notts County 1, Northampton Town 2. Corner, Northampton Town. Conceded by Alan Sheehan. Corner, Notts County. Conceded by Brendon Moloney. Attempt blocked. Ronan Murray (Notts County) right footed shot from a difficult angle on the right is blocked. Liam Noble (Notts County) wins a free kick on the left wing. Substitution, Northampton Town. Ryan Watson replaces Nicky Adams. Nicky Adams (Northampton Town) is shown the yellow card. Substitution, Notts County. James Spencer replaces Genaro Snijders. Attempt missed. Dominic Calvert-Lewin (Northampton Town) header from the centre of the box is too high. Foul by Graham Burke (Notts County). Foul by Alan Sheehan (Notts County). Marc Richards (Northampton Town) wins a free kick in the defensive half. Goal! Notts County 1, Northampton Town 2. Brendon Moloney (Northampton Town) left footed shot from the centre of the box to the bottom left corner. Ronan Murray (Notts County) wins a free kick in the attacking half. Attempt missed. Alfie Potter (Northampton Town) left footed shot from outside the box is close, but misses to the left. Joel Byrom (Northampton Town) wins a free kick in the defensive half. Attempt missed. Dominic Calvert-Lewin (Northampton Town) right footed shot from long range on the left misses to the left. Hand ball by David Buchanan (Northampton Town). Elliott Hewitt (Notts County) wins a free kick on the left wing. Attempt saved. Jon Stead (Notts County) right footed shot from outside the box is saved in the top centre of the goal. Attempt blocked. Nicky Adams (Northampton Town) right footed shot from the centre of the box is blocked. Substitution, Northampton Town. Dominic Calvert-Lewin replaces Lawson D'Ath. Goal! Notts County 1, Northampton Town 1. Jon Stead (Notts County) right footed shot from the centre of the box to the bottom left corner. Attempt missed. Liam Noble (Notts County) left footed shot from the centre of the box is too high. Attempt saved. Graham Burke (Notts County) right footed shot from the centre of the box is saved in the bottom right corner.